Poinsettias are the most popular holiday plant used to brighten the inside of your home. There are hundreds of cultivars to choose from in shades of reds, pinks, white and many variegated forms and varied in height and shape. The following will help you keep your poinsettia healthy through out the Winter. 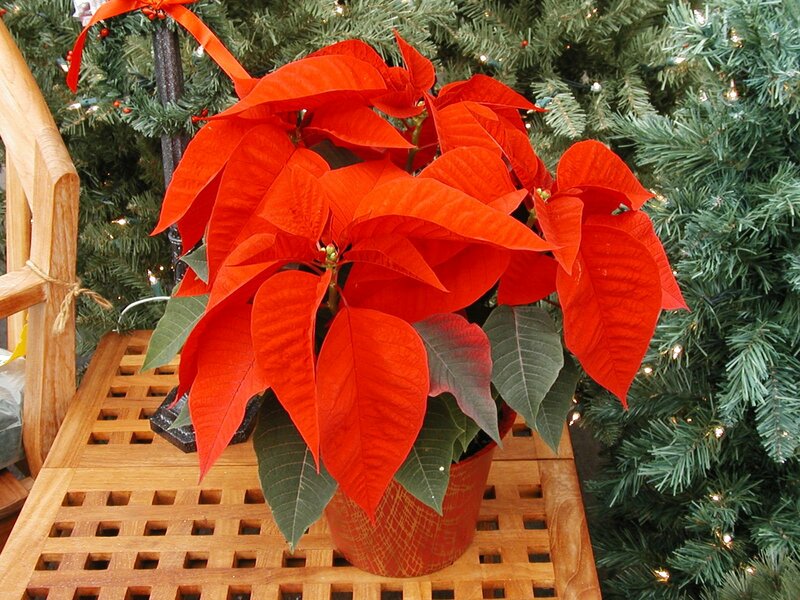 When selecting a poinsettia, choose tightly clustered, small central flowers with dark green foliage. The flower bracts, which are the colored leaves, should be of good size. When taking your poinsettia home, be sure the plant is well wrapped before you take it outside. Never leave a poinsettia in a cold car, even for short periods. When you get home, you may need to alter the decorative foil that is placed around the poinsettia pot. If there is not a hole in the bottom of the foil, remove it and poke some small holes into the foil. Place the foil back around the plant and place the pot in a saucer. This will allow water to drain when you water the poinsettia and the plant won’t be sitting in water. Poinsettias like bright, unfiltered light. Keep them away from any drafty areas or vents. This will cause the bracts (colored leaves) to fall off. Keep the soil slightly moist at all times but make sure the pot is not sitting in water. Large plants may need to be watered every other day. Poinsettias will keep longest at temperatures between 60 and 70°F. Some people choose to keep their poinsettias throughout the year and try to get them to bloom again the following Winter. This process can be difficult and it is usually easier to discard the old poinsettia and buy another one the following holiday. The following is what should be done throughout the year in an effort to get your poinsettia to bloom again. When the bracts (colored leaves) fade, cut the poinsettia stem back to about four to six inches in height. Keep the plant in a sunny window at a temperature between 60 and 70°F. Keep the soil moderately moist. Apply a water soluble houseplant fertilizer once a month. If the plant is too large for the pot, repot it into the next size container. Use a mixture of well-drained potting soil. After the danger of Spring frost is past (usually late April) and night temperatures exceed 55°F, move the plant to a partially shady spot outside. Between July 15 and August 1, cut back stems and branches again to promote a bushy plant. Bring your poinsettia plant inside around September 15. Place it in a sunny window as before. In order for your poinsettia to flower for the holiday season, keep it in complete darkness for at least 12-14 hours a day from the end of September until color shows in the bracts (usually mid-December). The poinsettia needs this daily short day-long night cycle to initiate flower buds and the colorful bracts we enjoy. The temperature should remain between 60 and 70°F. If this procedure is followed, the poinsettia will be in flower for Christmas.